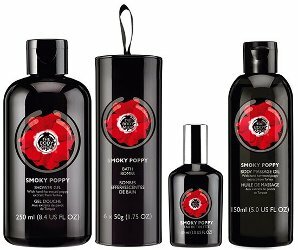 The Body Shop has launched Smoky Poppy, a new limited edition fragrance and body care collection. The body products include an extract of hand-picked poppies from Turkey. Our Smoky Poppy Eau de Toilette fragrance contains a captivating blend of sultry spices, elegant florals and earthy woody notes. You’re only a spritz away from seduction. Smoky Poppy Eau de Toilette is $14 for 30 ml. I do wish they’d do better descriptions! I read a review that said “sweet amber”, but I guess I’ll just have to go smell it. I hope I like this (or maybe I don’t… I’ve been spending a lot of money lately). I’m such a sucker for poppy imagery. Might have to swing by the mall later and see if my local store has this yet. I was very disappointed in Red Musk, hope this is better! I usually find the Body Shop scents to be underwhelming, but at least that package is great :). I am still on the fence about Honeymania. I thought this said Smoky Puppy at first…I thought, well, that’s interesting? LOL. I really like the packaging, will sniff..as Honeymania wasn’t a complete bust. Has anyone tried their raspberry butter cream? It smells just like raspberry preserves or a turnover. Not bad. Their cranberry I didn’t like. There were tons of cranberry left from the clearance they had..doesn’t seem like many like that scent either. Not sure. It sounds kind of interesting. I checked the store locator on their website to see if there are any stores in Houston, and apparently the only one left is in Intercontinental Airport, way up on the north side of town. Ulta carries some Body Shop stuff, so I’ll keep an eye out there and see if it turns up. I ALMOST really liked Red Musk, but somehow it just seemed a bit flat? I purchased Red Musk on Black Friday for a steal, but even at that price I have to agree with the above commenters that it does seem pretty boring. I am intrigued by the sounds of this new fragrance from The Body Shop. I might have to stop by the mall later today and try it out.